PSNC President and COO Rusty Harris presents $50,000 donation to Peter Chasse of The Water Project, Inc.
GASTONIA, N.C., (May 3, 2010) – In response to the earthquake damage in Haiti, PSNC Energy has donated $50,000 to The Water Project, Inc. in support of the non-profit’s efforts to coordinate repair of water wells in Haiti. 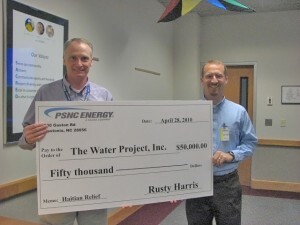 PSNC Energy President and COO Rusty Harris presented the $50,000 check to Peter Chasse, The Water Project’s president and founder, on April 28 at the company’s monthly business review meeting. Well restoration work is foundational to the rebuilding efforts in Haiti. “Without access to safe water, little else can be done,” explained Chasse. In addition to PSNC Energy’s gift, the natural gas utility’s parent company, SCANA Corporation, has also given $50,000 each to the American Red Cross, Habitat for Humanity International, and Water Missions International to fund additional earthquake relief efforts still underway in Haiti. PSNC Energy, headquartered in Gastonia, N.C., is franchised to serve a 28-county service area in North Carolina. The utility distributes natural gas to approximately 473,000 customers in 96 cities and communities, including the Raleigh, Durham, and Chapel Hill areas in the north central part of the state; the Concord, Statesville, Gastonia, and Forest City areas in the Piedmont; and the Asheville, Hendersonville, Brevard, and Sylva areas in the western part of the state. More information about PSNC Energy is available through the company’s web site at psncenergy.com.